…and in a related story of similar ignorance. Some people in the audience applauded McNeil’s response. However, one student appeared up-set and asked McNeil what gave him or the federal government the right to tell an American that they can’t build an institution. “This religion’s plan is to destroy our way of life,” McNeil said. The student responded by saying he did not feel it was a Christian’s place to determine whether Islam is right or wrong. “It’s our place as Christians to stand up for the word of God and what the Bible says,” McNeil replied. Dianne Berryhill, an independent candidate for the Congressional seat now held by Rep. Allen Boyd, D-Monticello, also weighed in on the proposed mosque. “If we were under Muslim law, you girls wouldn’t be sitting here showing any kind of skin. You would be in hot burqas and … you wouldn’t be sitting in school,” she said. No other candidate weighed in on the controversy during the debate. The comments came during a forum at North Bay Haven Charter Academy hosted by WJHG News Channel 7. The debate was organized with the help of Tim Kitts, the chief education officer for Bay Haven Schools, but students in all the local high schools, with the exception of New-point Bay, asked the questions. Among the other candidates at the forum were Pat Sabiston and Joe Wayne Walker, who are in the running for the School Board District 1 seat, and the three candidates, Jim Barr, Steve Moss and Donna Allen, running for the District 5 school board seat. Sabiston, who currently holds the District 1 seat, discussed a national model for in-school suspension as a way to discipline students in school and a change in the procedure for purchase orders to save money. Walker expressed the importance of giving children opportunities, even if they don’t want to go to college. Allen, a longtime school board member, said she found it imperative that school board members be accessible to students and visit schools. Barr, like Allen, finds accountability to students important. Moss addressed the importance of proper nutrition in school lunches, explaining that food has an effect on energy levels, so nutritional food potentially could lead to higher test scores. In the District 2 Congressional race, McNeil is running against Steve Southerland and David Scholl in the Republican primary. Eddie Hendry and Barbara F. Olschner, both of whom also are running for the District 2 GOP nomination, did not attend. Paul McKain, an independent candidate, and Democrats Boyd and state Sen. Al Lawson, D-Tallahassee, are also in the running. Boyd and Lawson did not attend. Berryhill is running as an independent. The Congressional candidates in attendance Tuesday all said they were conservative constitutionalists, and each talked about the importance of self-reliance. “We can’t depend on the government, but we can depend on ourselves,” Scholl said. The last candidates to debate were four of the five candidates for the District 4 county commissioner seat: Guy Tunnell, Bill Busch, Dan Estes and Derrell Day. Cathy McClellan did not at-tend. The candidates discussed their plans to improve tourism and the economy. Several of the candidates said the free market would be the best system to make these improvements, and the government should not get in the way. The topic of legalized gambling in Florida and the possibility of building a casino in the area came up. Although a casino could raise much-needed tax revenue, Day said caution must be taken. Estes said the ideal thing to do with the extra tax revenue is start paying off debt. After the debate, Lewis and Kitts talked about the quality of the questions. “What I got from the candidates is that they have not had questions that have been this thought out,” Kitts said. One student, who posed several questions, commented on the candidate’s performance. The primary election is Aug. 24, although early voting already is under way. If you consider yourself an American watch this. One thing that seems to be overlooked in this Manhattan mosque/activity center scuffle and the broader debate over integration and assimilation is just how well Muslim immigrants have done in the U.S. We don’t have the Muslim ghettos, separatist movements, rioting, and the tense cultural clashes Europe has. There have been some arrests of alleged home-grown Islamic terrorists in America, but there are going to be extremist outliers in any ethnic, religious, or ideological group of 3 million people (the estimated number number of Muslims in the U.S.). According to the poll, the only subset of American Muslims where support for Al Qaeda and suicide attacks gets unccomfortably high is among native-born African-American converts, many of whom converted in prison. To the extent that this particular subset of American Muslims is more prone to radicalism and less optimistic about America, it has nothing to do with immigration/assimilation problems, and seems more likely to stem from lingering hostility about race. That is, it’s an American problem, not a Muslim problem. I’m not an immigration expert, so I’m not going to pretend I know everything that factored into it, but it’s worth repeating that the story of Muslim immigrants in America over the last two generations is unquestionably a success story. There’s the temptation to caution that all of the demagoguery and marginalization of Muslims over the Cordoba Center threatens that success, and could shake loose more potent factions of European-style Muslim radicalism in America. But the Pew poll suggests the overwhelming majority of American Muslims held to their sense of place in U.S. society even after September 11 and its immediate aftermath. It’s worth condemning the “Ground Zero Mosque” demagoguery for the naked pandering to fear that it is. But the good news is that Muslim Americans appear to be confident enough with their position here that the escalating hysterics of Sarah Palin, Newt Gingrich, & Co. aren’t likely to budge their general optimism about America. NEW YORK — A JetBlue flight attendant got into an argument with a passenger on a jetliner arriving at John F. Kennedy International Airport on Monday, cursed the passenger, grabbed a beer from the galley and then deployed an emergency exit slide and fled the plane, authorities said. Flight attendant Steven Slater was arrested at his home in the nearby Belle Harbor section of Queens by Port Authority of New York and New Jersey police on charges of criminal mischief, reckless endangerment and trespassing. Slater, 39, remained in custody Monday night. His attorney’s name wasn’t available, and there was no home telephone number listed for him. A woman who answered a phone at a previous residence listed for Slater in Thousand Oaks, Calif., identified herself as his mother but said she wasn’t speaking to the media. JetBlue Airways said in a statement that it was working with the Federal Aviation Administration and Port Authority police to investigate the matter. It said the safety of its customers and crew members was never at risk. Slater was working on JetBlue Flight 1052 from Pittsburgh when he got into an argument with a passenger who was pulling down baggage from an overhead bin, the Port Authority said. The luggage apparently struck the attendant in the head, and he asked for an apology, but the passenger refused, the agency said. 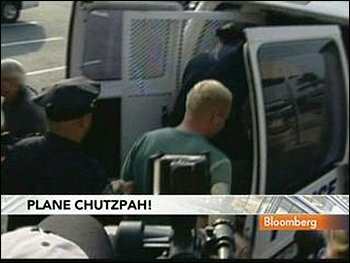 As the plane was landing, Slater got on the public-address system and cursed at the passenger, the Port Authority said. Slater then grabbed at least one beer, activated the slide, slid down and went to his car, the agency said.